Online reputation management is critical in today’s highly digital-focused world. More customers are online, and they want to see what a business is all about before they ever contact them or consider their services. While some assume digital reputation management is about social media monitoring, your digital reputation goes well beyond Facebook and LinkedIn. Here are 5 Tips to help keep your online rep in tact. There are a few infamous cases of poor reputation management that forever changed how the public viewed these companies. Some even lost customers. For example, Dark Horse Café received a Tweet on Twitter from a client who criticized their lack of outlets for people working while drinking coffee. Instead of responding in a positive manner and considering critical reputation mgmt., they decided to shoot back an aggressive/defensive response. The same goes for Amy’s Baking Company, which has a one-star internet review that they responded unprofessionally with, and that inadequate response gained local news attention. Your company should have a reputation management protocol in place for how to respond and react to poor publicity. Most business owners do not have a plan in place when an emergency reputation management crisis occurs. Therefore, they find themselves scrambling. Other companies have a strict protocol. For example, they have responses in place for types of comments, and they give answers quickly while following up with an official press release later. Now is the time to sit down and create a few scenarios your reputation may suffer and have a policy in place for how you will respond. Business PR starts with monitoring. 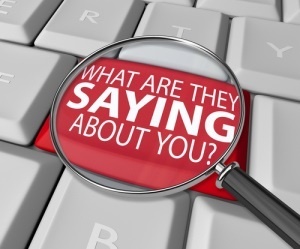 You should know what is being said about your company, then respond accordingly. Listening tools exist, but you can use free options like Google Alerts to tell you news about your business or brand. Regardless of how negative and aggressive a comment is about your business, you still must respond thoughtfully and professionally from your end. No mocking, stay in control of your emotions, show compassion toward the person upset, and commit to making it right. Also, communicate. The best way to keep a negative customer from spreading more negativity is to communicate with them and your followers. Respond quickly to comments, and show the public that you care about what is said, and you work hard to fix any wrongdoing on your part. Say what you know immediately, and say what you do not know. This does not mean looking incompetent, but transparency at least provides people with confidence when you have a bad comment or review online. It is okay to say you are aware of the problem via social media, and that you will provide more details when you have them. Ignoring the issue, however, or pretending nothing negative is happening will not help your company’s public image. There can be posting moderation guidelines for your platforms, which will limit what comments are accepted on your business’s blog posts. While you cannot do the same on social media, this at least helps you filter defamatory or inappropriate comments before they are shown to the public and eventually recognized by Google. What reputation mgmt. tips can you share for a growing business’s PR strategy?